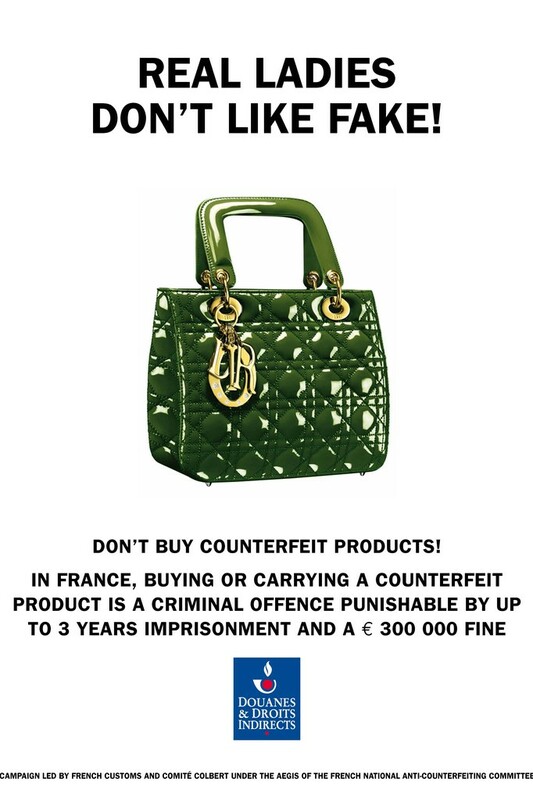 A collection of French luxury brands have joined forces in a fight against counterfeiting. They launched a new campaign that uses tongue-in-cheek slogans to raise awareness of the issue. The billboard campaign will be displayed at all French airports during the summer months and is mainly focused on travelers. Because, although the majority of counterfeit products are made in Asia, the roots of the problem lay at home. The people buying fake goods are not Chinese or Vietnamese, but they are European. It’s not that one has to feel sorry for these huge luxury houses that still make a lot of profit, but why would you want to support a criminal network? Would you rather give your money to them? I don’t see why people would want to buy a fake bag. If you don’t have the money for the real stuff, then there are lots of nice bags, shoes and stuff in the retail stores today to make you happy. Point made! This entry was posted in Fashion and tagged campaign, counterfeit, fake by sofischoice. Bookmark the permalink.